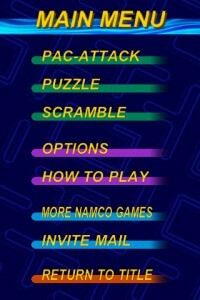 Pac-Attack [$2.99] is a new puzzle game from Namco featuring everybody’s favorite ghost-munching yellow circle. You may already be familiar with the game from its original SNES/Genesis release, or from one of the many Pac-Man compilations over the years. This new iOS version is a bit different from the original, featuring graphics that are more akin to the retro Pac-Man rather than the cartoonish look of the 16-bit offering and an online competitive mode through Facebook. Gameplay remains largely the same, however, and if you liked the original game then you should also like Pac-Attack on your iPhone or iPod touch. 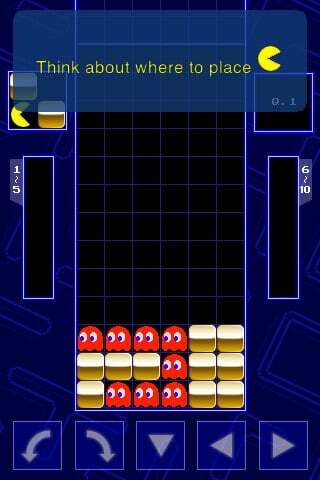 Pac-Attack plays similar to Tetris or other block clearing puzzle games. 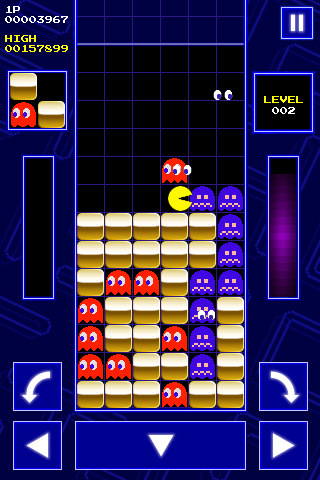 Groups of three blocks consisting of solid pieces, ghosts, or Pac-Men will drop from the top of the playing field. Filling an entire row with solid blocks clears that row, and when you drop a Pac-Man block he’ll make his way down into any available spaces in his path eating ghosts along the way. The solid blocks and ghosts both abide by gravity, so if there are openings below them they will fall down to fill the space, adding a bit of strategy to how you lay down blocks. After eating a certain number of ghosts a fairy will appear as a block at the top of the screen and will eliminate any ghosts in the eight rows directly below where you place her. There are three main modes in Pac-Attack. The first is aptly named Pac-Attack mode, and is essentially an endless high score run which has you earning points by clearing the board as the game progressively speeds up, and if you blocks reach the top of the screen it’s game over. Before starting the game you can choose one of four difficulties as well as the starting speed of the falling blocks, which is a nice touch. Next up is Puzzle mode which features 100 different preset levels in which the goal is to clear all the ghosts on the board. The groups of blocks you receive are predetermined and must be placed in just the right way so that Pac-Man can run down the board and gobble up every ghost. This mode is a lot of fun, but can be incredibly hard as you get farther into the 100 levels. 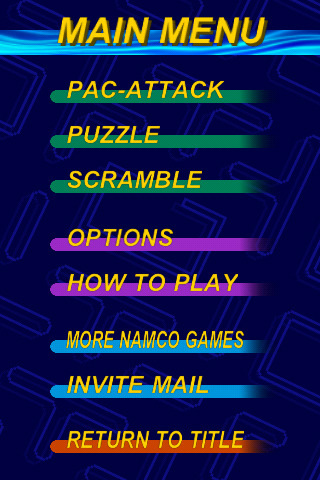 Finally there is Scramble mode, which is essentially a timed version of Pac-Attack mode that lets you compete with your Facebook friends. Pac-Attack isn’t an incredibly remarkable game, but it is well made and can be pretty fun if you enjoy Tetris-like puzzle games. The graphics are sharp and controls work really well, offering four different onscreen button layouts or a direct dragging option. The Puzzle mode is where I spend most of my time, and there are some fiendishly clever game boards contained in that portion of the game. The Scramble mode with Facebook Connect is nice, but I would have much preferred Game Center integration for high score tracking. 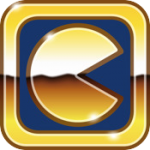 If you have a soft spot for Namco’s famous mascot, or have nostalgic feelings for the original game, then give Pac-Attack a look.